The applause the greets this live recording of Bruckner's Seventh Symphony, as captured on this release from Hänssler Classics, sounds a little muted. It's an understandable reaction, since Norrington's approach – already heard in releases of the Third, Fourth, and Sixth Symphonies – seems even more bracing and revisionist in the Seventh, one of the composer's most popular and consummately crafted works. An immediate glance at timings gives an idea of just how different Norrington's interpretation is to what we're used to. As the booklet rather tentatively puts it, 'The first movement perhaps seems unusually quick and counter to all listening habits', and, at a whisker over 15 minutes, Norrington shaves nearly seven minutes of Paavo Järvi's recent account on RCA, for example. The change in the Adagio is perhaps not quite as shocking, but is still very much on the swift side, coming in at just over 19 minutes. The final two movements are fast but much more what we're used to. On first hearing, the shock is undeniable, and is only heightened by the conductor's (in)famous insistence on no vibrato from the strings. However, it is remarkable how thought-provoking the performance is, raising all sorts of questions on repeated listenings. The most obvious effect of Norrington's tempo choices is to underline the symphony's heritage, emphasising its foundations in Viennese classicism rather than the proto-Mahlerian tendencies that are often overemphasized; indeed the main factor for lazily yoking the two composers together – the basic dimensions of their symphonies – is made absent. More than ever, one's reaction will depend on personal expectations for the repertoire, and one's willingness to accept the lack of monumentality in the opening movement in the particular: those expecting that Brucknerian cathedral of sound to loom imposingly will undoubtedly feel short changed. The more expansive passages take the least adjustment, with the broad sweep of the opening theme preserved, yet the swifter sections can sound inappropriately rushed. This is particularly the case with the quaver idea, marked Ruhig, that is introduced in the unison strings around 3'50, and whenever we have big dotted-rhythm statementa, which become jaunty rather than grandiose. The performance, too, rather contradicts the booklet's suggestion that the symphony was influenced by the mystic – and somewhat static – soundworld of Wagner's Parsifal. The lack of vibrato makes for a loss of impact in some of the higher-lying string passages, but also results in a cleaner, more classical line. To hear the Adagio in such a way can result in some of the bridging passages seeming to meander a little, but Norrington's build-ups are finely judged, and the playing of the Stuttgart orchestra impressively committed. The accounts of the final two movements, too, are very fine: at bracing but less controversial tempos, the lean, athletic sound of the orchestra is particularly effective here. 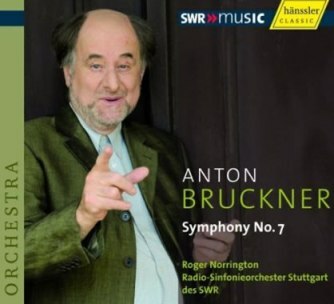 Those who are already following Norrington's Bruckner will have no need to hesitate, while anyone else wanting to hear a fresh, iconoclastic account of this favourite symphony will be intrigued. Whatever one's view on Norrington's decisions – and the booklet fails to specify the source of 'the latest information on the tempi of the works' – one cannot fault his singleminded execution of them, nor doubt that his main aim is to serve the composer.